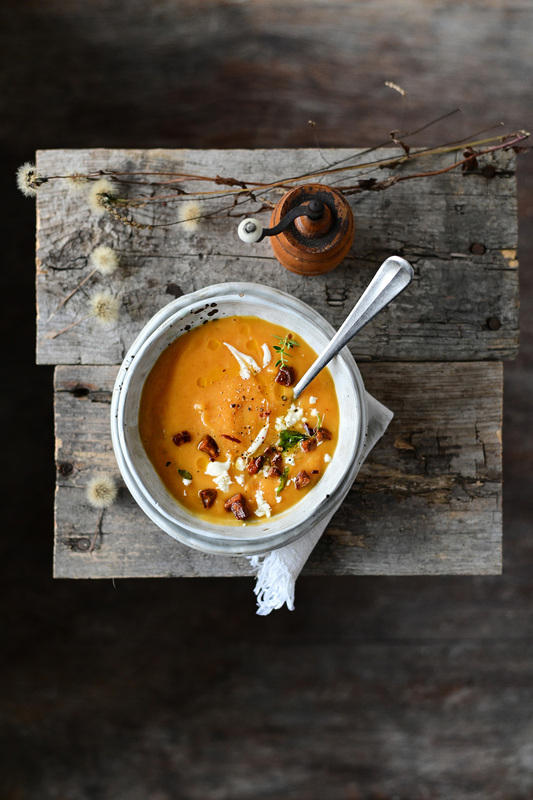 Cold days will get much better with this roasted pumpkin soup with chorizo crumb and feta cheese. Soft and creamy pumpkin pureed with caramelized shallots, garlic, fresh thyme and a touch of olive oil. Each bowl is swirled with sour cream and topped with crispy chorizo, salty feta and fried sage leaves to create the perfect savory bowl soup that’s warming and delicious… and there’s nothing not to love about it. Cut the pumpkin into cubes, combine with olive oil, salt and pepper. Place on a baking tray, bake in the oven for about 20 minutes at 180°C. Heat the olive oil in a large pot, cook the shallots and garlic until soft. Add celery, pour the broth and season with salt, pepper, cayenne pepper, paprika, thyme leaves and nutmeg. Bring to a boil, boil for 5 minutes, then turn off the heat. 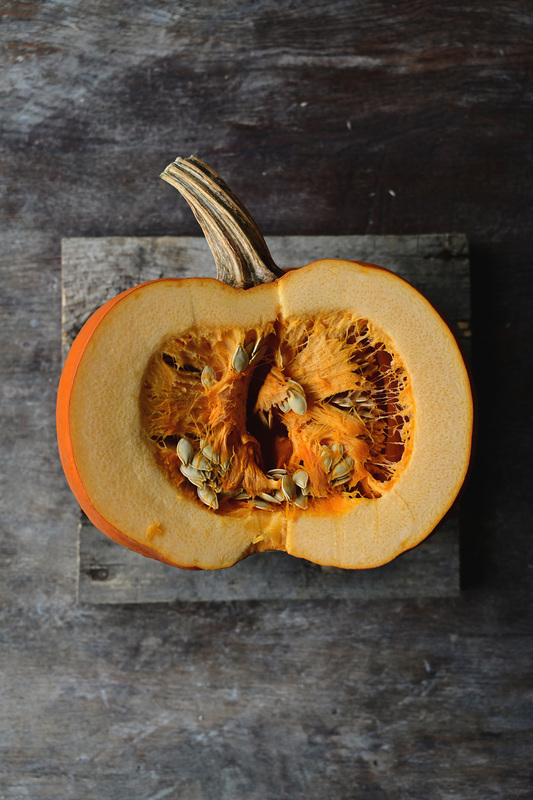 Add the roasted pumpkin and blend with a stick blender. Heat the olive oil in a skillet, add the sage leaves and fry for 3-4 seconds. Remove the sage, add chorizo to the same skillet and fry until crispy. 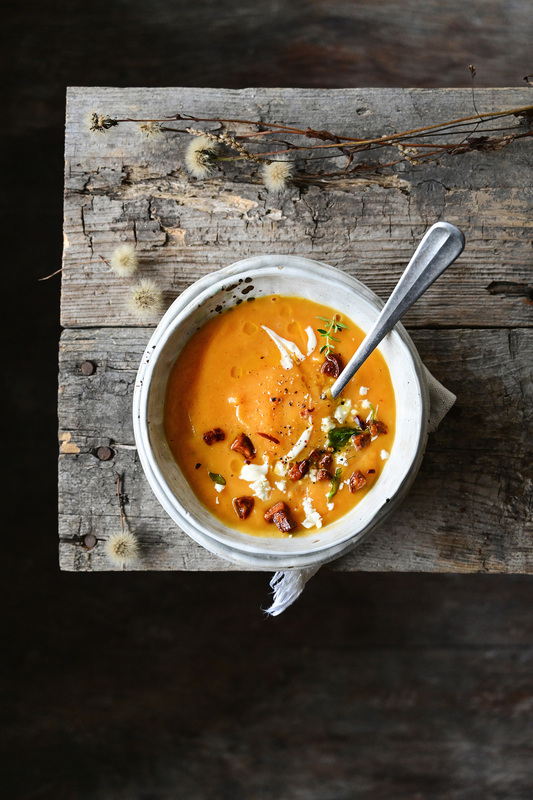 Ladle the soup into bowls, serve with sour cream, sprinkled with chorizo and crushed feta. Top with fried sage leaves and chili flakes. Enjoy! This soup looks so warming and delicious – perfect cold weather food! Your photography is stunning! This soup sounds amazing. I love the bright colours and the warm ness of your photo! Loving all the additions to this soup, especially the caramelised onions and sage. thank you! it’s so delicious! Chorizo and roasted pumpkin (or butternut squash) is a favourite combination of mine, I think the flavours are so perfect for each other. Love the look of this warming soup! Agreed! I hope you try this! I’m a huge fan of chorizo and this soup sounds so tasty! I would definitely love to gobble up a bowl right now for lunch. I absolutely love the flavours you had added to this soup. It looks so delicious and comforting. Such a delicious sounding meal.